I don’t know why pasta salads only ever seem to show up at parties and picnics, because they’re easy and delicious. This one, as you can guess from my title, was made for a party. My sister-in-law’s baby shower, that is. Because it was made for a big party, it’s a big recipe! This will serve a crowd at a party or as a side for a cookout. It’s a recreation of a pasta salad I once bought at the deli counter at Giant. Directions: mix everything, chill in the fridge a while to let the flavors mix, and then eat. The amount of dressing you need will vary depending on your taste, and on the noodles. I sometimes find I need to add more after the salad has sat in the fridge overnight, because the noodles drink in all the dressing and leave the salad a little dry. I’m sure it would be tasty with other dressings, too, but I haven’t played around with that yet. 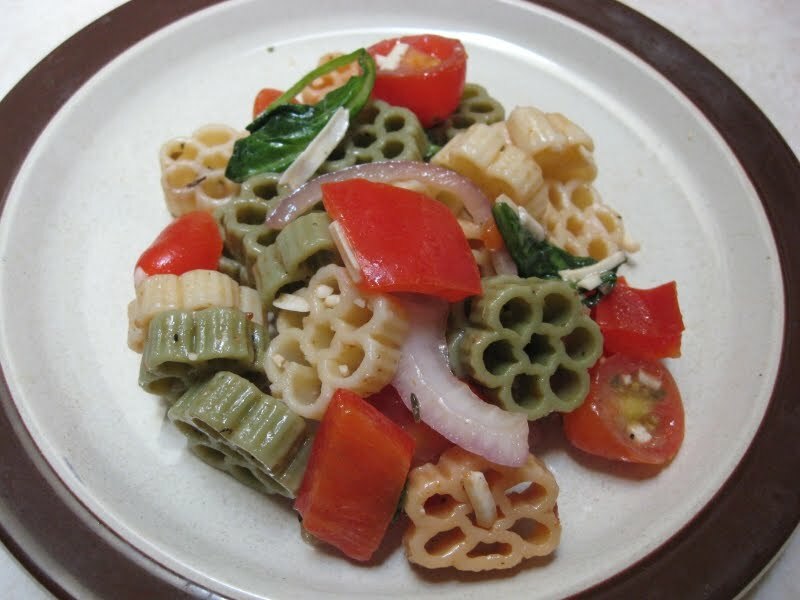 As with all pasta salads, it’s flexible and you can change the amounts of the ingredients or omit some altogether. Oh, and because this is meat-free and not made with mayonnaise, it can sit out on the table for a while without poisoning your party. A big plus! This entry was posted in Uncategorized on April 3, 2011 by antijen.